Esophageal varices present a series of symptoms that we can ignore until they get worse. Discover what they are and what the treatment options are. We all know what varicose veins are: dilations of the veins that cause venous insufficiency. However, there are also esophageal varices located in the final part of the esophagus. That make it difficult for blood to pass through. It is important that we tell these changes to the doctor. An early treatment will prevent this disease from getting worse. How to know if I have esophageal varices? The greatest risk of esophageal varices is rupture and possible bleeding. To know if we have esophageal varices or not, a study published in the Spanish Journal of Digestive Diseases exposes those factors that affect its appearance and the possible signs to be taken into account in this pathology. Black deposits. Although we can not give importance to this color, if it is caused by this type of varicose veins is due to the presence of blood. This occurs due to the breakage of varicose veins. Vomiting of blood. At first, dizziness or nausea may occur, until vomiting blood. Given this, we must go to the doctor quickly. Loss of consciousness. It usually happens due to the hemorrhage produced by the esophageal varices, which leads to dizziness and fainting in the most serious cases. If these symptoms persist over time, it is necessary that we see the doctor as soon as possible. Losing consciousness, being dizzy or vomiting blood can alert you to this type of varicose veins that are seriously affecting our health. To make a reliable diagnosis, after having gone to the doctor with the symptoms mentioned, we will perform an endoscopy. This allows even biopsies to be able to adjust the diagnosis as much as possible. With endoscopy, a camera is inserted through the esophagus to see if there are varicose veins, in addition to analyzing its severity. That is, if they are thick, if there is a large amount, if there is a serious hemorrhage in the area, etc. Depending on the type of varicose veins they will choose to treat them in one way or another. For example, if there is very little amount, they are small and there is no bleeding in the area, the doctor may choose to recommend a follow-up to see how this problem evolves. Through endoscopy, doctors can make an accurate diagnosis and the most appropriate treatment. Supply of medicines: if there is no bleeding, although there are large varicose veins, drugs are supplied to reduce their pressure. Endoscopic ligation: when the previous treatment option can not be applied due to intolerance or side effects. You can strangle varicose veins with rubber rings to promote their disappearance. Endoscopic sclerotherapy: When there is hemorrhage by injecting a substance inside the varicose veins. All these treatments can have consequences. For example, your body may not tolerate medications, manifesting unpleasant side effects such as nausea, diarrhea or dizziness. For this reason, the doctor will perform a follow-up test. It will be very important to detect which treatment will work best for the patient who is suffering from esophageal varices. Further info: Reduce Thrombophlebitis Varicose Veins Naturally Using One Of These Homemade 9 Remedies! The people who should be more careful with the symptoms or signs that can alert of the presence of this type of varicose veins are those that have cirrhosis (liver disease) or that have gone through a thrombosis. Although esophageal varices can appear due to other causes, these are more susceptible risk groups. Finally, in the presence of dark stools, dizziness or vomiting with blood should see the doctor as soon as possible. A quick treatment will reduce the suffering and discomfort that the patient goes through. It will, as well prevent the situation from getting worse. Having large varicose veins that break can cause a very serious hemorrhage that can put the patient’s life at risk. Therefore, do not underestimate the signs that may be warning us of the presence of this type of varicose veins. 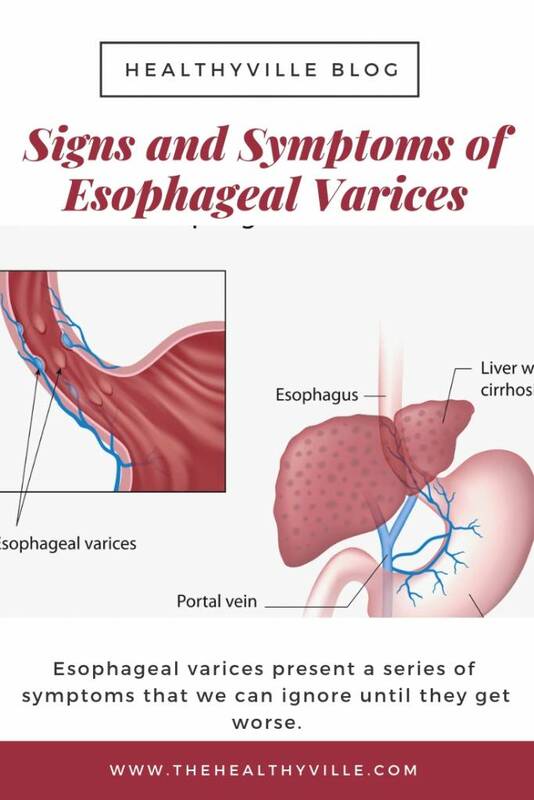 Don’t forget to SHARE the signs and symptoms of esophageal varices with your friends and family on your social networks!